Think Global is an electric car company located in Aurskog, Norway, which manufactures cars under the TH!NK brand. The Th!nk City is one of the world’s only two crash tested and highway certified electric cars, with the Tesla Roadster being the other. The company was originally founded in December 1991 in Oslo, as Pivco (for Personal Independent Vehicle Company). The first practical prototype, the PIV2, like the vehicles that followed, were built around a chassis made of aluminium and carrying a body made of polyethylene thermoplastic rotomolded in one piece. The chassis were developed by Hydro Aluminium Tonder in Tønder in Denmark and were one of the main reasons that Ford later acquire 51% of the stocks. 10 of 15 prototypes were built in time for the Lillehammer Olympic Winter Games in 1994. The battery technology was NiCd, driving a three-phase AC induction motor via the front wheels. PIV2 was followed by the PIV3, the City Bee (Citi in the US), introduced in 1995. 120 of these were produced, 40 of which participated in the San Francisco Bay Area Station Car Demonstration project from 1995 to 1998. Production ceased in 2002, after 1005 units had been made. Many of these cars participated in station car projects in California and in New York City. Probably due to changes in the California zero-emissions vehicle policy, Ford gave up Think on January 31, 2003. The company was sold to KamKorp Microelectronics of Switzerland, owned by Kamal Siddiqi. Development of a successor to the City was subsequently halted. The used cars from US and UK have been re-exported to Norway where they are in high demand due to the government's policy to promote the use of electrical cars (EVs are exempt from taxes, have free parking, pass toll roads for free, and are allowed to drive in the bus lanes avoiding traffic congestion). At the end of March 2006, Think Nordic was acquired by Norwegian investment group InSpire, which includes the original founder Jan Otto Ringdal as a partner. The company was renamed Think Global. For the next year, the Th!nk website showed a restyled "new TH!NK city" car which was under development. An open version of the car was also pictured but the company said it had no plans to put it into production. The original English page reported: "We are currently in the process of preparing the new TH!NK city for production in the fall of 2007. The new TH!NK city has ABS brakes, dual airbags, and meets all European and US safety requirements. It has a range of 170 km (110 mi), a top speed of 100 km/h (62 mph) and has comfort and convenience features such as air conditioning, power steering, sun roof, electric windows and mirrors, and more". In May 2007, Tesla Motors, maker of the electric Tesla Roadster super-car, announced an agreement to sell 43 million dollars worth of its Li-ion battery systems to Think Nordic for use in the next generation Think City, but on 2 Nov 2007 it backed out of the deal. 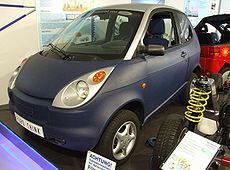 The Th!nk assembly line was restarted in late November 2007 to start manufacturing the re-designed City car. On March 5, 2008, General Electric, A123 Systems and Think Global announced that Think, GE and battery manufacturer A123 Systems had entered a partnership to enable global electrification of transportation. GE invested USD 4 million in Think and USD 20 million in A123 Systems to help A123 roll out batteries for Think. A123 Systems and Think at the same time signed a commercial supply agreement. The partnership was announced at the 78th annual international Motor Show in Geneva. Also at the 2008 Geneva motor show, Th!nk unveiled its future five-seater, 130 km/h (80 mph) concept car, the TH!NK Ox. In July 2008, TH!NK introduced the Th!nk City for the first time in the UK. As of August 2008, some 100 City cars have been manufactured for customers in Norway. On December 15, 2008, Th!nk suspended all vehicle production and laid off 50% of its staff pending negotiation of up to USD 29MM in funding for working capital, citing "urgent financial distress.". As of January 13, 2009, Th!nk Global has received a bridge loan of 40 million Norwegian kroner (~$5.69 million) to continue operation. Much of that bridge loan came from one of its battery suppliers, Enerdel. Th!nk is expecting to secure a new round of funding before the money in that bridge loan is exhausted. On August 27, 2009, Finnish Valmet Automotive and Think Global AS announced that Valmet is starting the production of Think electric car in 2009, the deal also includes engineering. Valmet will invest around 3 million euros ($4.27 million) to the project, it will also become a minor shareholder of the company. The production of THINK City car started in December 10, 2009 at Uusikaupunki.